The AugSTEM scholarships will be funded by a nearly $600,000 grant recently received from the National Science Foundation. The grant means that as many as 30 students in biology, chemistry, computer science, mathematics, and physics will receive important financial support as they pursue their academic careers. "In today's world, many students balance educational goals, the demands of family responsibilities, and the pressure to support themselves financially," said Amy Gort, Assistant Vice President of Academic Affairs and Dean of Arts and Sciences. "These AugSTEM scholarships will help students maintain focus on their studies and have more time to explore career paths." 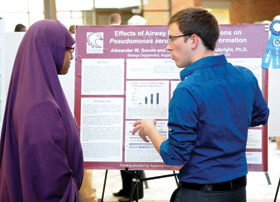 Development of the grant proposal and the AugSTEM program was possible through a collaboration among faculty and staff. "Science faculty recognized the high talent of our STEM students, and the tensions they balance between school and the rest of their lives," said Benjamin Stottrup, Associate Professor of Physics. "We worked as a team to seek NSF funding. Our goal is to continue providing a rigorous academic experience that develops critical thinkers while providing additional programmatic support for these scientists as they transition to the workplace." About 50 percent of the scholarship recipients will be transfer students, and will further strengthen Augsburg's partnerships with community colleges. "We know from investigating the degree process of transfer students at Augsburg that we receive a significant number of transfer students in STEM," said Rebekah Dupont, coordinator of the College's Lois Stokes Alliances for Minority Participation (LSAMP). "Through the AugSTEM program, we hope to collaborate with STEM faculty at community colleges to support more seamless transitions for these students and to connect them more quickly with our continuing students." Next steps for the AugSTEM program include recruiting students to apply for the scholarships and making final programming decisions for fall. AugSTEM programming will include workshops and seminars, focus on professional development, and support Augsburg students in their transition to the scientific workplace. The AugSTEM collaboration was led by Stottrup and Dupont, and the joint effort among faculty and staff will continue through the life of the grant. To learn about the team members, please see the A-Mail story. To learn more about the grant, visit the Awards area of the NSF website. Augsburg College currently has more than $3 million of active NSF funding. The largest individual active award, for more than $1 million, is for the ongoing work of Physics Professor Mark Engebretson for studies of magnetospheric physics. Partial support for the AugSTEM program is provided by the National Science Foundation Scholarships in Science, Technology, Engineering, and Mathematics (S-STEM) program under Award Number DUE-1154096.